This short pathway runs along the Seine River adjacent to the residential community of Royalwood. It is named in honour of Louis Riel Sr, the father of Louis Riel, arguably Manitoba’s most famous son and perhaps the most controversial figure in Canadian historiography. 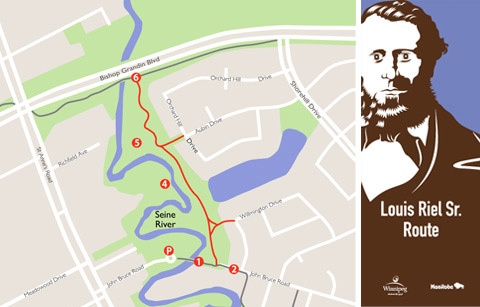 Louis Riel Sr who was born at Île-à-la-Crosse in what is now Saskatchewan, moved to the Red River settlement in 1843 where he married and had eleven children of whom the eldest was Louis, the famous Métis leader. Riel Sr became well known as the ‘miller of the Seine’ after he established a mill on the Seine River, near St. Boniface. John Bruce Road foot bridge – Once a bridge for vehicular traffic, this is now a scenic foot bridge and an inviting starting point for this walk. 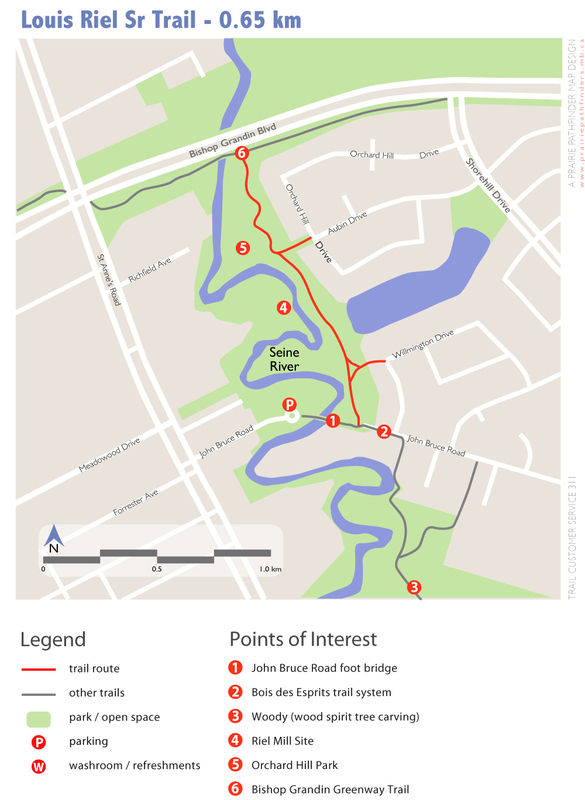 Bois des Esprits trail system – Comprising 47 hectares, this trail winds through the largest contiguous river bottom and upland forest in Winnipeg. The parkland is diverse in habitats that support a wide range of wildlife and fish species. Woody – A three-metre tall “Mhtik” (wood spirit) carved from a giant elm tree, guards the Bois des Esprits forest. Riel Mill Site – In the 1840s, Riel Sr established a mill on this site to grind grain and card wool for the Grey Nuns of St. Boniface. Tradition has it that almost single-handedly, he dug a nine mile channel to divert water to turn the mill wheel. Orchard Hill Park – A manicured green space butts up against the wild native river forest vegetation of the Seine. This linear park follows the course of the river adjacent to the upscale residential neighbourhood of Royalwood. Bishop Grandin Greenway Trail – Extensive tree plantings, interpretive signage, eco-education and bench installations as well as a community garden make this 6 km multi-use trail a vital link to communities and amenities in southeast Winnipeg.